I remember seeing the video for The Message on the Old Grey Whistle Test in 1982. It blew me away. 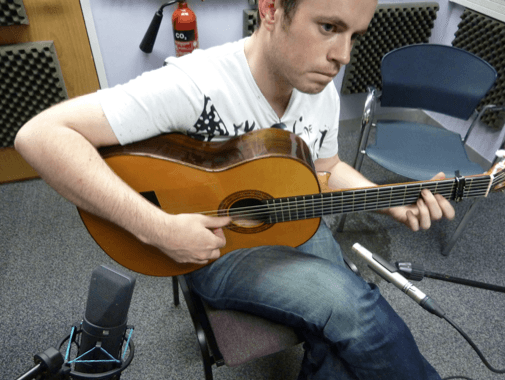 Over the summer break I was asked to record a session for Walsh Gonzalez in the University’s studios. 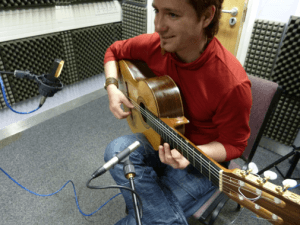 John and Lucas are a flamenco/classical guitar duo from Ireland and Argentina. They play nylon-strung acoustic guitars and are both excellent musicians. 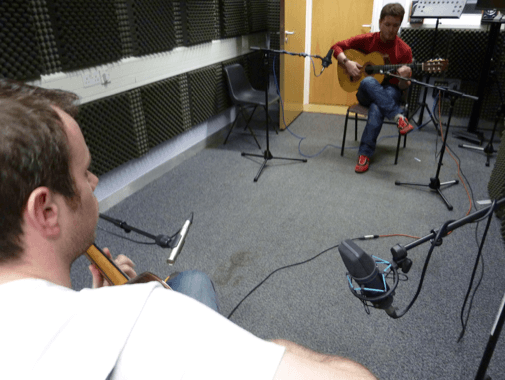 The aim of the session was to capture a natural sounding performance as possible. While the guitarists and their instruments were warming up, I listened to them playing in two of the studio’s recording areas. We decided the tone of the instruments sounded better in the less ‘live’ sounding room and, as they were going to be playing together in the same room (without headphones), this also helped cut down on spill into each other’s mics. They set up at either end of the room facing each other, about 3 metres apart. I decided to use two microphones on each guitar, not to capture a stereo image, but to blend the tones at the body and the neck of the instruments. For this I used a Neumann U87 at the body and a Rode NT5 at the neck of John’s guitar and a AKG C414XLII at the body and Rode NT5 at the neck of Lucas’s. After experimenting with the position of each mic I found the body mics sounded best (full but not boomy) around 30 – 40cm from the back of each guitar, pointing just behind the soundhole. Both mics were set to cardioid and with a flat frequency setting. The Rodes could come a little closer in (around 20cm) and were positioned pointing to where the neck meets the body, here the detail of the performance could be clearly heard. Each pair of mics was checked for phase (both on the mixing desk and in Pro Tools) and were found to be in phase. When the phase on one of the mics in a pair was flipped the comb filtering at the bottom-end was very noticeable. The musicians replaced the strings on their instruments and bedded them in with another half hour of warm-up play. Each mic was assigned its own track in Pro Tools and all that was left to do was record a number of performances and select the best takes. Mixing the tracks was pretty straight forward. No compression was used – the two mic tracks for each guitar just needed balancing together. A little EQ was used on John’s Neumann track to shape the low-end. After a lot of experimenting with the pan position of each mic track, I settled on the body mic for John’s guitar being panned left (10 o’clock) and the neck mic panned left (9 o’clock). Lucas’s guitar body mic was panned right (2 o’clock) and the neck mic right (3 o’clock). Possibly a little strange in terms of true stereo imaging but I liked the sound of them in these positions. Both neck mics had a low cut applied and were sent to an aux reverb to give a more natural sound to the mids and highs. I think the recordings capture the intended aim – a natural sounding performance. However, I have to say this was made so much easier by having musicians who can play well and who know their material. Thanks John and Lucas – I enjoyed it! 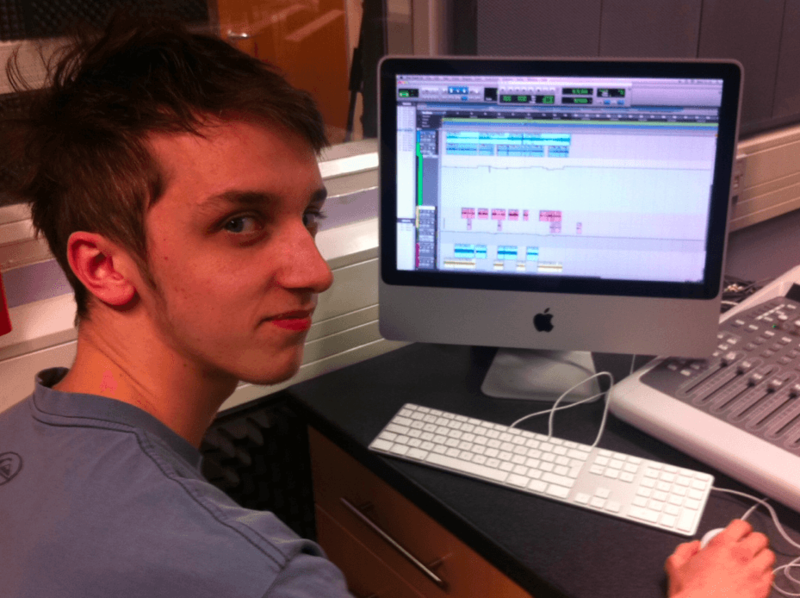 Level 2 Audio Production student Luke Pickering’s new band on Bandcamp. All tracked and mixed by Luke at the University’s studios. It’s the music which has surrounded us our whole lives, but which most of us have never quite heard let alone listened to… and nearly all of it made in the UK. 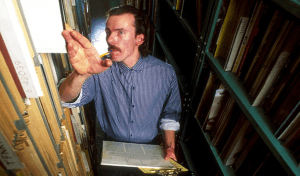 Sometimes called ‘Source music’, ‘Mood Music’ or as it’s best known, ‘Library music’: a hugely important part of British sonic history. 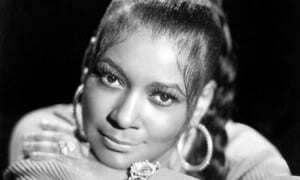 Its use and purpose is simple: it’s well produced, economic music for film, TV, advertising and radio. Never commercially available to the general public, this music was pressed onto vinyl from the 1950s onwards in short, limited quantities and then sent directly to TV production houses and radio stations for use when necessary. Sports themes, situation comedies, game shows, cartoons, talk shows, classic children’s tv, the testcards and even Farmhouse Kitchen was brought to us all with the help of library music. Themes for Terry And June, Grange Hill, Mastermind, Match Of The Day and of course that gallery tune from Vision On are all well placed library cues. But there are reels (and reels) of gorgeously crafted, equally great stuff that never made it past the elevator door! We have been surrounded by it forever, but we know so little about it…. Where does it comes from? Who actually makes it? And how do you actually set about making music for the inside of a waiting area, a lift or for a plane before it takes off? In this first ever documentary about library music we’ll look into its history (starting in 1909), speak with the dynastic library owners (de Wolfe, KPM, John Gale), We find out what’s it’s like to make music to imaginary pictures by speaking to the library music makers (which could include Jimmy Page and Brian Eno), and even have a word with the Musicians Union who banned UK recording of library music throughout the late 60s. We also talk to the modern day enthusiasts, the collectors (Jerry Dammers) and explore the contemporary influences of this extraordinary musical genre. And of course re-acquaint ourselves with some of the most familiar music we’ve never listened to! 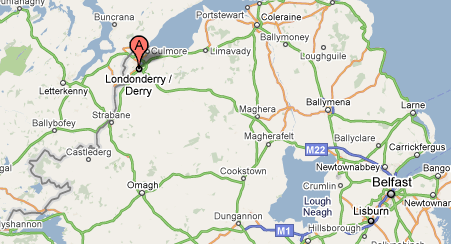 Interesting piece on Radio 4 about how Londonderry bands see their ownership as a two-way street with their fans. With a world premiere of all the videos on 4th November in Manchester, here’s a taster of the videos featuring in Clear Notice’s debut music app release for the iPad. More information on the Clear Notice website. The premiere will take place at 8pm on Thursday 4th November 2010 and tickets are FREE, but issued on a first come, first served basis. Along with the first full screening of the Enter Calico music videos will be an artist / videographer Q&A session (inc. David McSherry), giving you the chance to find out more about the work of CNR’s talented artists. Tickets are strictly limited, so please grab one only if you’re sure you’re able to attend. 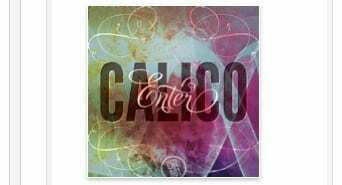 Enter Calico Trailer from Clear Notice on Vimeo. It’s Kesteven & Grantham Girls’ School centenary year and to celebrate they wanted to record an album of pieces performed by the school orchestra. 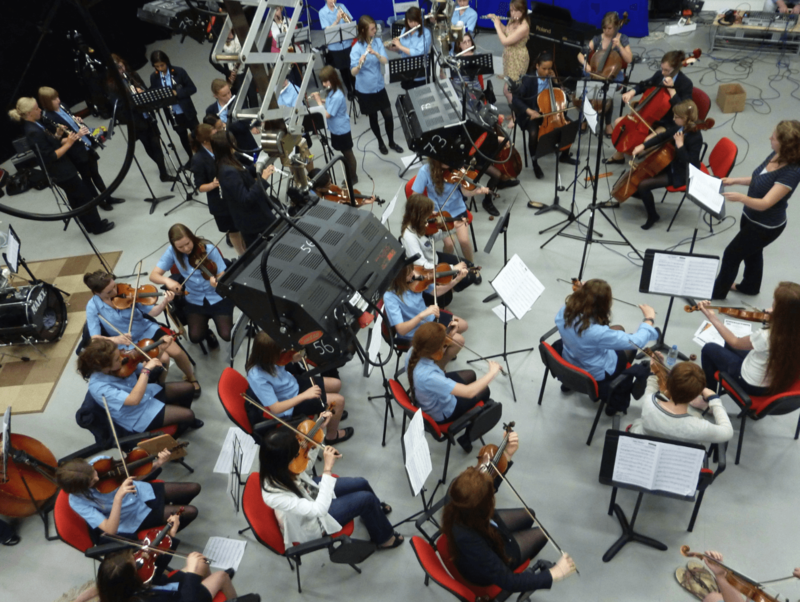 Under the expert guidance of Bryan Rudd, the musicians of the 45 piece orchestra set up in the University’s very own Abbey Road Studio 2, the large TV studio (Monk’s Road Studios, perhaps?). We patched in the various arrays of C414s, C1000s and MT201s and balanced live to stereo. Even though we were very pushed for time the recordings turned out very well due to the nice acoustic of the room and some really great playing by the musicians. 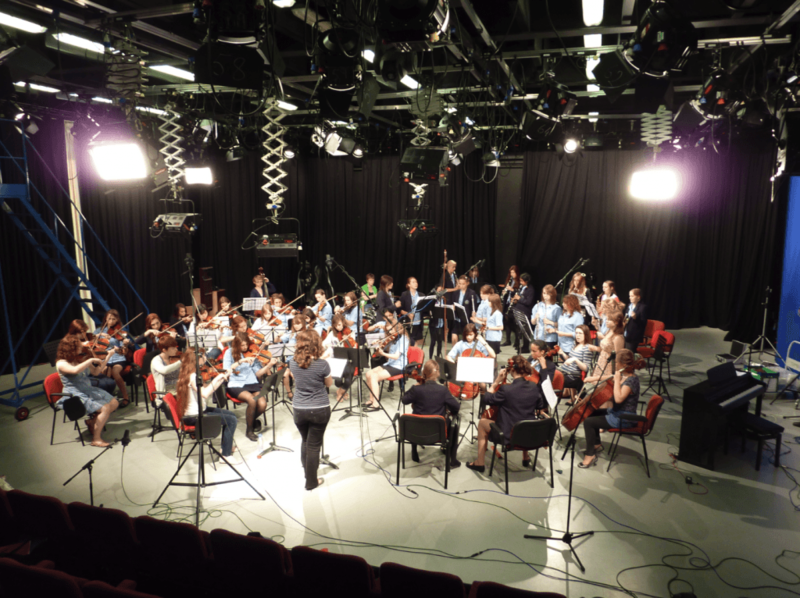 I’ve never recorded a full orchestra before so this was a very enjoyable experience for me. I’ll post more details of the album when it is completed, for now, you can listen to one of the pieces below. Also integrates with Soundcloud. 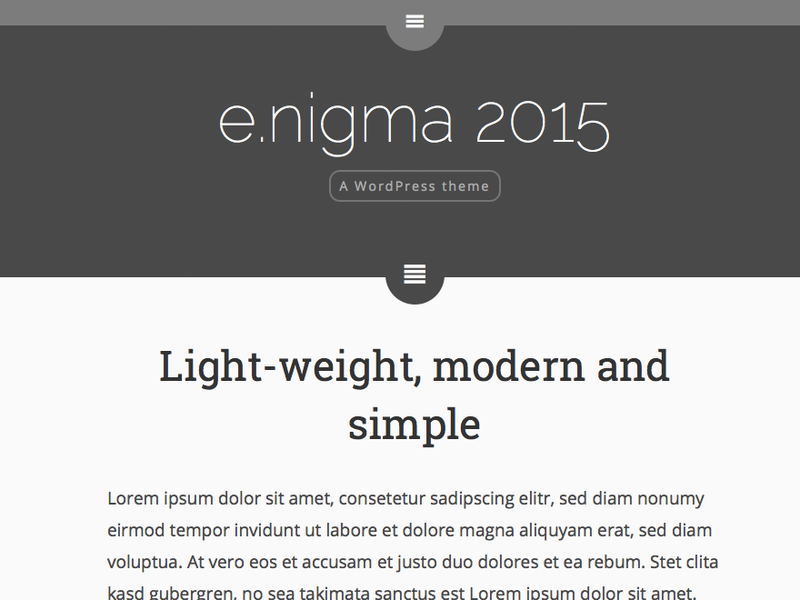 Don’t forget to have a look at Bandcamp too. Can you do better than this? Published on:May 1, 2010 Category: POP, Uncategorized	1 Comment on great Mash-Up ! !